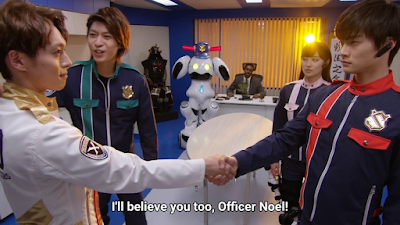 Lupinranger VS. Patranger Nombre 21: Just Whose Side Is Noel Takao On? Disclaimer: Super Sentai is a property of Toei. Also I'm no expert in Super Sentai either, I'm just me sharing my thoughts on the franchise. Bonjour readers! Last week was definitely not a surprise about a double agent coming in from le last episode. Yup, Noel Takao himself is working on both sides for a reason. 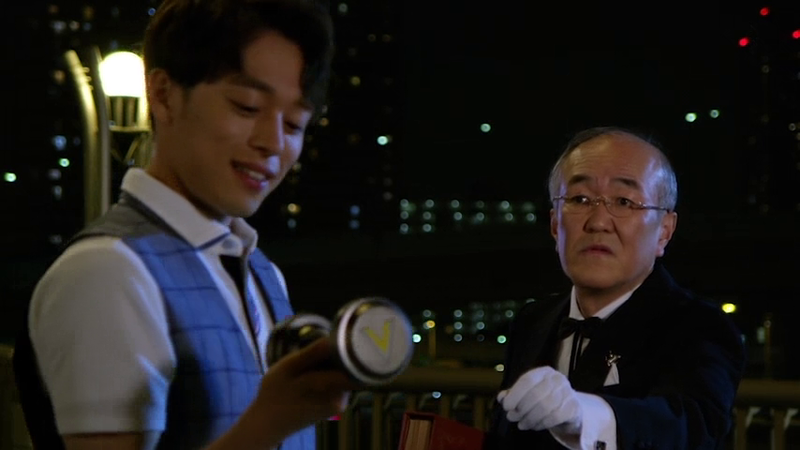 Was he sent to unite all le Lupin Collection for the good of mankind -- even if it means getting that hotblood Keiichiro to work with Kairi? Would that mean putting both sides to a truce so the Ganglers can finally be defeated? Looks like it! Noel arrives at Le Bistot Jurer where he meets the butler of le Lupin Household namely Kogure. So they know each other. So why would le Lupin estate sent him? More importantly could he really be le young master that le audience is looking for? It turned out he created le Lupin Collection modifications for both sides. He wants to put them into good use but can he unite both teams? There's still trust issues. 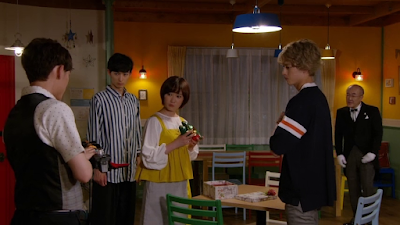 Noel's got higher orders so he can't tell le other side -- le Patrangers le identities of the Lupinrangers. I am really thinking that maybe, just maybe he's not really Noel Takao but maybe his real name could be something else. What if he's really half-Japanese, half-French like Arsene Lupin III and his real surname is Lupin? He's being so secretive. At this point, he works as a double agent. 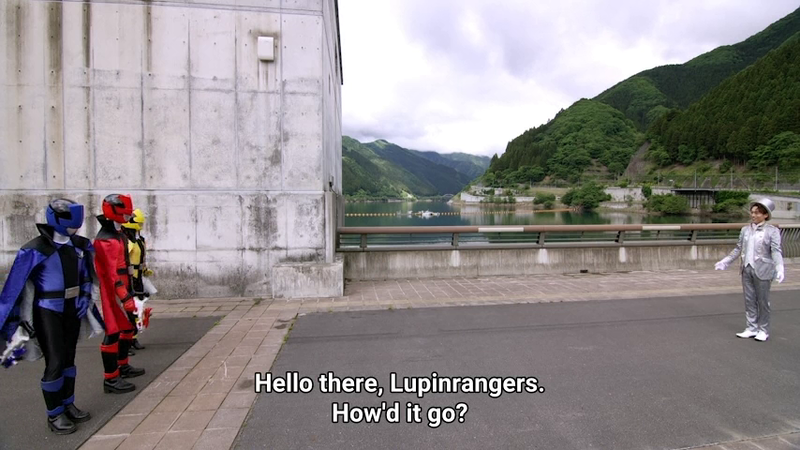 He informs le Lupinrangers where the Patrangers are and how to get le latest piece. They arrive at le location. Noel must be very careful in whatever task he has. If he's planning to unite both teams then it's going to be very difficult. Le monster of le week Gabatt uses the Turn to Stone piece from le Lupin Collection. Stone or silver? Well, regardless he's already hard to hit as long as he's in hard mode. Hmmm... too bad neither side thought of using a really explosive attack but again, they're near a dam so they can't risk it, right? Also, he plans to flood le city with his cavities which is set to destroy le dam. Meanwhile, here's one amazing fight scene with Noel using both modes as Lupin-X and Patren-X. This has him regain the confidence of le Patrangers. Then we see more of what's to come. Le train has two modes namely gold and silver. 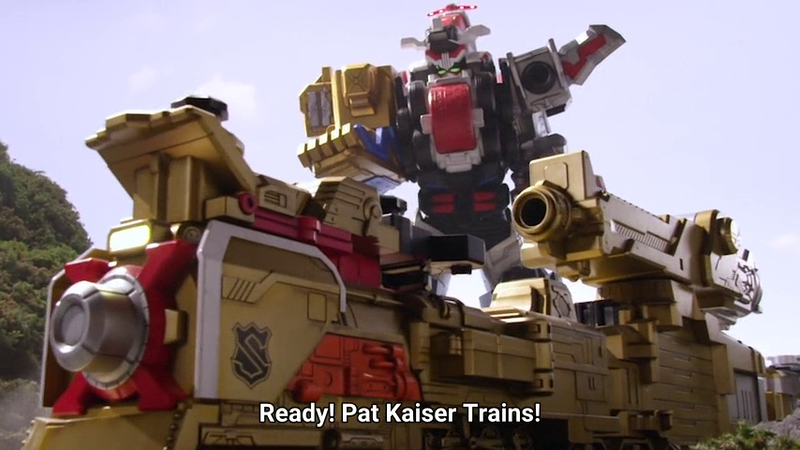 As Lupin-X he uses silver part of the train and as Patren-X he then uses the gold part. Pat Kaiser uses le trains used from le last episode in order to form yet another robot. But when can we see le three trains combine together? Also, when can we see le possible combination from both sides? I feel like we could be getting close to it! Meanwhile, Noel gets le trust but it turns out that he's actually had some brilliant plan. He has le Lupinrangers and him fight to make him look like he's really on the side of le police. I guess, he's already known how stupid Keiichiro really is so he has to work on a psychological warfare. Noel has to try to find ways to get both sides working together if that's what he intends to do. I mean, why do you think he's got a connection to both le Lupin Estate and le Patrangers, right? Kogure meets with Noel and wait -- isn't that the Twin Cutter from Fiveman? It's even got the V insignia! They are going to chat but what is it about? I just really can't wait to see it on le next episode which should probably be a bridge to get both teams together! Next week, Sakuya somehow plays matchmaker. Sakuya still doesn't know that Umika is Lupin Yellow but I think he has to know it sooner or later. I mean, why not put a Batman vs. Catwoman romance for once? I also would like to see both of them in conflict of interest while trying to pursue a romance with each other. 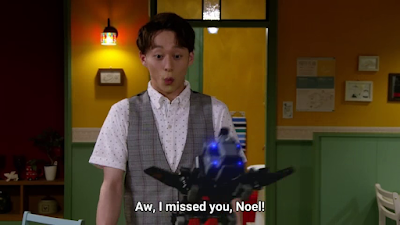 Well it's time to greet thee oh readers for another Ryusoulger episode review! This time, it's the conclusion to last week's episode where Cerberus Menasaur's venom also has a poisonous effect. Sidenote, venom is administered through biting or stings -- which passes through an open would while poison is absorbed through swallowing, skin absorption and inhalation. So the Menasaur is both poisonous and venomous. Now, Tankjo prepares his biggest attack yet. Everyone is wondering why Sanai isn't cured yet. Banba is sure that he did destroy the Menasaur while Melt assumeth that there could be a twin out there. So how two Menausaurs were born instead of one is just awfully puzzling as of the moment. I wish the show can try to explore more of these elements. The research did not specify the age groups considering much time has passed during the Heisei era which started on 1989 and now it's 2019. A total of 30 years and a few months have passed from January 8, 1989 up to the day the survey was given. So what's my latest reaction to the survey? I find all these answers to be rather random which I'd explain. Ever heard of the plot where it says, "Real Life Writes the Plot"? Well, it's already very common and plenty of them has happened. Super Sentai is no exception to the rule. Ever heard of the first Kamen Rider series when Hiroshi Fujioka injured himself during the stunt scenes that they brought in a second Kamen Rider as a result? 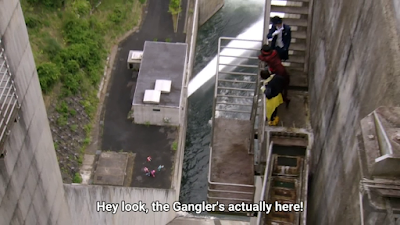 Super Sentai has had those issues which would result to certain plots happening every now and then. Now this post is subjected to what I'd call a MASSIVE reboot and man, this post was written so last December 7, 2008 and now it's September 3, 2015. Now it's already December 29, 2017 and I decided to add more to this entry. I thought I might edit some old posts and this is one of them. Gotta admit, gotta stay true to myself! Now it's time for a massive edit and I think it's time to do a revised list! Arguably she was my first Tokusatsu crush. If Americans had Kimberly, I had her dubbed over as Kimberly which I found rather... weird. I would admit that she was my first Tokusatsu crush. Ryusoulger Episode 4: Koh And Towa Can't Get Along?! Well it's time for another Ryusoulger episode. Art thou ready? Well, this episode starts to build up the relationship between the primary team and the secondary team. Dost thou remember the episode where Ryusoul Elder telleth the first three Ryusoulgers to team up with the other two? Now this one is the first part of an attempt to join with them. 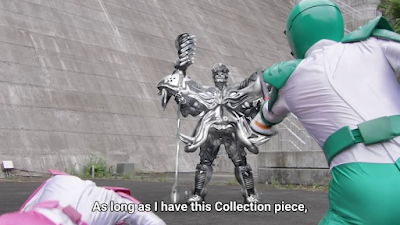 Koh is too enthusiastic of an idiot -- though idiot heroes aren't necessarily bad unless you've got stuff like the way Kento Shimoyama handled Takaharu, a few times Lucky gets too over-enthusiastic in Kyuranger or well Daigo Kiryu in Kyoryuger. 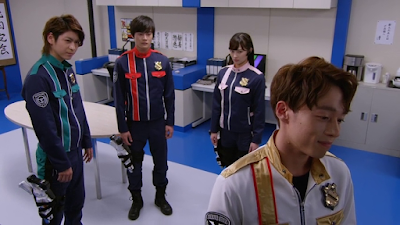 Koh trieth to reach out both Banba and Towa but they find it "Nah!" 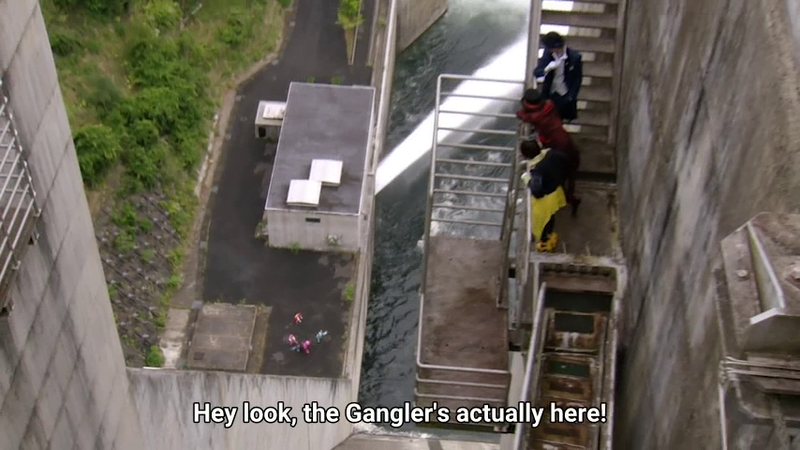 to the idea of joining up with the Ryusoulgers. Ui's father is looking for the map that would find the temple. So it turneth out that map would lead to the temple. So who took it? Well it was Koh who was going to make a deal with the other two. Please DO NOT copy/paste my content.